Memphis’ Raleigh Springs Mall is a pretty creepy place. This winter, in the midst of my cross-country drive, I stayed at a Sleep Inn on the Old Austin Peay Highway, about a mile south of this place. I had all of my most important worldly belongings in the car, so I was already a bit paranoid and unable to sleep because I had already gone through a few nights of worrying someone would steal away with my beat up pair of Chucks, a microwave with a broken LCD, and an HP computer with Vista installed (guess which one of these three things is crappier?). The stay was sort of unsettling, and the electrical storm we experienced while we were there didn’t help–the Days Inn right next door to us was actually hit directly by lightning at about 5am. I was passing through fairly quickly, so I didn’t have enough time to visit many of Memphis’ retail offerings, but Raleigh Springs was convenient enough. I had known Memphis had lost at least one high-profile mall due to crime (or the perception thereof), the infamous Mall of Memphis, aka the “Mall of Murder.” Raleigh Springs Mall, located on the other side of town from Mall of Memphis, opened in 1971 on the Austin Peay Highway north of I-40 as one of the first two malls in the greater Memphis area. JCPenney, Sears, Lowenstein’s, and Goldsmith’s were the original four anchor tenants at this Edward J. DeBartolo Corporation-built center. There was also a Woolworth’s store in the mall that was later replaced by a multiplex cinema. 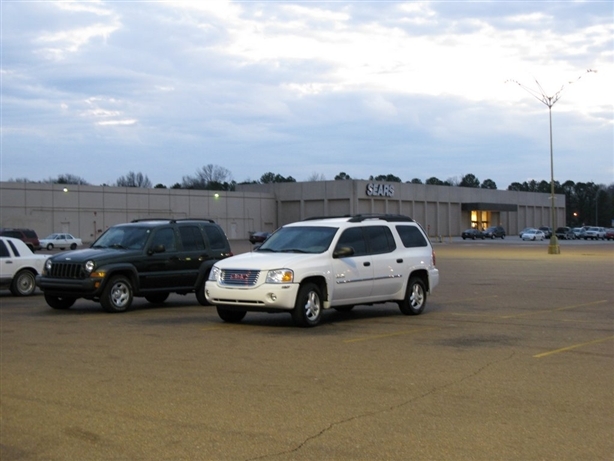 For some time, Raleigh Springs Mall was the dominant mall for the Memphis area, but traffic was yanked away by newer, more glamorous centers such as Hickory Ridge Mall and the aforementioned Mall of Memphis over the years. 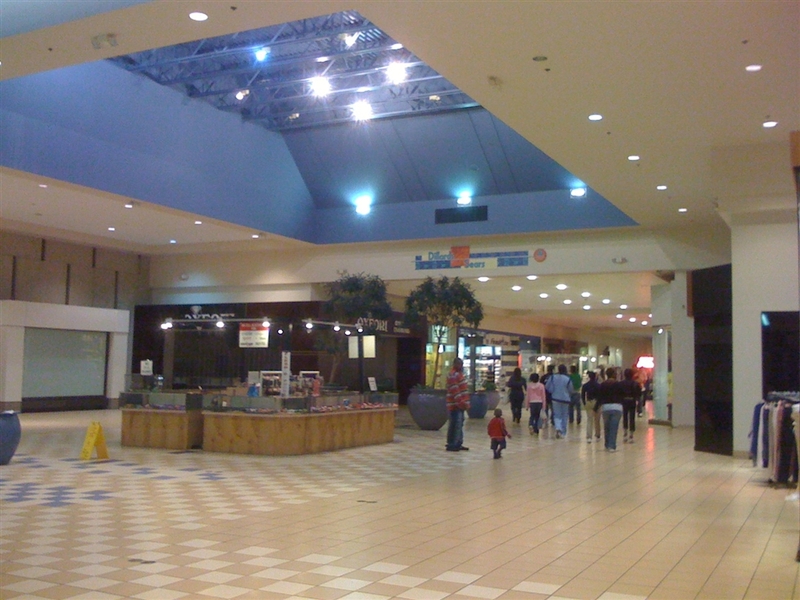 In 1997, the opening of the Wolfchase Galleria–now the most dominant mall for the Memphis metropolitan area–and an increased perception of crime at Raleigh Springs (it’s far closer to Memphis proper than its newer cousin) helped fuel the mall’s downfall. 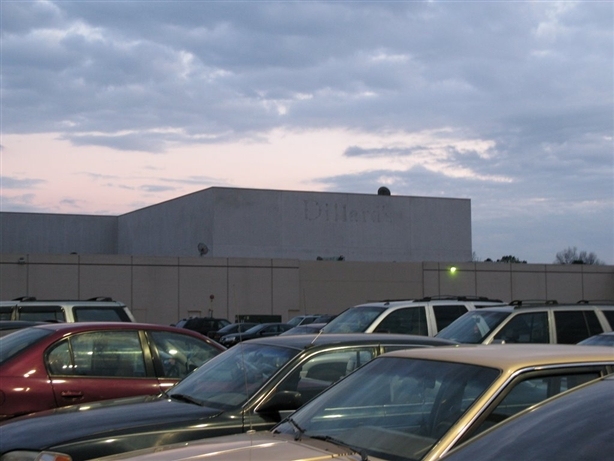 Dillard’s, who had acquired Lowenstein’s in 1982, closed their store in 2003. Federated Department stores, who had just acquired Goldsmith’s, the middle anchor, opted not to keep the store (or convert it to a Macy’s) and shuttered it the same year. The third strike also came in 2003: the JCPenney store–since downgraded to an outlet–scooted out, leaving Sears as the lone anchor tenant in the hulking structure. Today, the mall is eerily quiet with little foot traffic, and as you can see in these photos, the expansive parking lot is mostly empty. 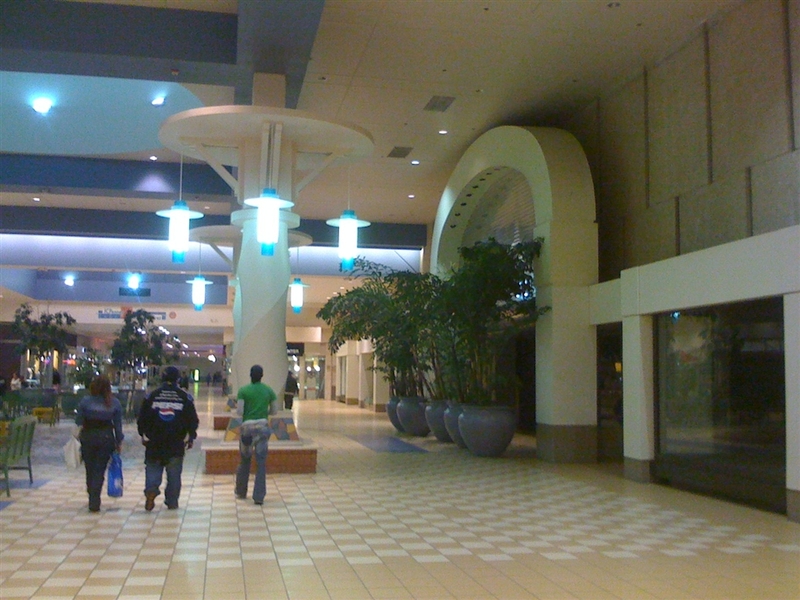 Portions of the complex are in poor repair and only about 20 or 30 of the mall’s stores are occupied, many with secondary-type tenants. The interior of the mall is in reasonably good shape, the result of a renovation that (I am guessing) probably took place in the early 2000s. Raleigh Springs Mall looks pretty forlorn for now, but things may be looking up. Wal-Mart has expressed interest in demolishing the vacant JCPenney space and building a Wal-Mart Supercenter on the site, though nothing has started yet. Hopefully it will at least have mall access! We know what happens when Wal-Mart turns their back on the interior of a mall. I can’t belive this is a SIMON mall. While you were in Memphis, did you perhaps visit the Hickory Ridge Mall on the far southeast suburbs, the one hit by an EF3 tornado on Feb. 5, ’08? I hear Macy’s won’t reopen at the mall because of damage to their store, leaving Sears as the lone retail anchor. This one might be going the way of Raleigh Springs soon, and I’d love to know more about the mall. The Hickory Ridge Mall is a total dead mall. Only Sears is left. It’s owned by some sort of church and the whole place (except Sears) is shuttered. The Hickory Ridge Mall website is still up and says it’s reopening Summer 2009 but I doubt it. A visit a week ago showed some sort of work being done (contractor’s trucks) but the place is roped off. If they’re reopening anytime in the next two years, I’d be surprised. The macy’s sign is still up. The old Target just west of the peoperty is a super seedy pawn shop now. It takes up the whole Target building. 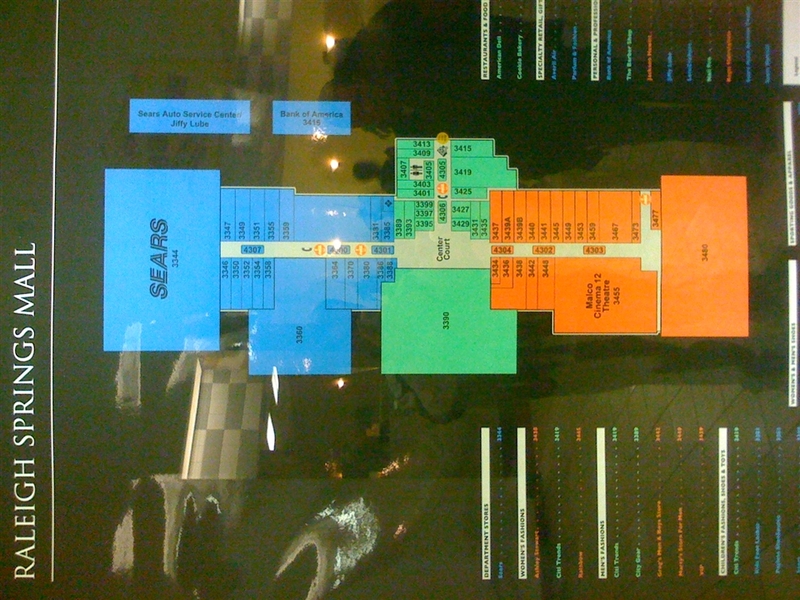 Sears actually owns their 100,000+ square foot space. The rest of the mall (490,000 sqft) is vacant. The Sunrise Mall on Long Island’s south shore has a Wall-mart with 2 levels & mall access. I don’t think that is common. Yeah I’ve bben to Sunrise. And I guess if Westfield can do it, SIMON can. Wal Mart is probably the best fit for a mall like this, rather thn a Macy’s or something. Sean: I also believe Hilltop Mall in Cali has two stories (Supercenter or not, I don’t know), Baldwin Hills Mall in Cali has a THREE story Wal-Mart, and Christown Spectrum Mall has a Wal-Mart Supercenter. Wow, a mall without kiosks; wide open spaces for your strolling pleasure. It’s too bad it’s dead. The drop ceiling and neon probably don’t help. You know my theory on low ceilings in a mall (spells d-o-o–m). We went by Hickory Springs last August, and ate at a place on the corner of the mall site (not in the mall itself). It didn’t look very healthy then at all, and a lot of the stuff around the mall seemed to be gone too. We didn’t feel comfortable going inside, and our hotel was about 2 blocks away from the Mall of Memphis nonetheless. If you think this part of town is crime ridden. You don’t know crime very well. Yes, the motel area is not attractive and the area is old. But, no shoot up bang, bang stories come out of this little ditch area. I am suprised nothings happened yet because of the new government housing access apartments located nearby. However, let’s call it what it is and not what you percieve it to be. The mall looks like it was remodeled by Feldman Mall Properties. The directory is in the same font as my local mall, Golden Triangle Mall in Denton, TX, also owned by Feldman. The whole mall also looks like conceptual drawing of what Feldman wanted to do with Golden Triangle, but has yet to do. I have not been to Raleigh Springs in almost 10 years and it was pretty bad back then. I remember it as been dingy and pretty boring. I also remember it as being one of the last malls you could smoke in. There was a square in the middle of the mall where you would let you smoke. As far as Hickory Ridge goes, my parents went by there in June. They said the area is getting bad. None of my friends in Memphis will go near that mall, which is sad because I have fond memories of having dance recitals there and shopping when I was a kid. They said most of the mall is still closed and does not appear to be reopening anytime soon, if it ever does. I recall shopping here on trips from Little Rock and I had last been in Memphis in 1985 before moving here in 1997 for grad school. They have the original decor still with the cheesy fountain in the center. The renovations came way too late since people started shopping at Wolfchase in 98-and 99. I work for the City and think Wal mart is not going to build here. There is a fledgling Super K mart up the street and wal mart has a history of taking old K marts and making them wal marts. This was true in Texas where they chased K mart out of the state. There is a proposal to de mall the site and make it a urban town center type of development. Wow, this is sad. I grew up in the neighborhood just East of the mall and I remember when it opened. Mom was thrilled at the prospect of NOT having to drive down to Southland or Sears Crosstown. My girlfriends and I rode our bikes to Raleigh Springs and wasted countless entire days there – I guess we were pioneer mallrats! I performed in recitals there and even attended the charm school classes held in the basement at Sears. I learned to drive in the mall parking lot after hours. We moved out of state in 1980 and it was a long time before I began to look back, so the news of my old community going to hell is a nasty surprise. Can it be rehabilitated? I sure hope so. wow, i can’t believe it’s so empty, but it looks tons better than it did in the ’80s when i used to hang out there. i doubt much of the original scene there still exists, but i remember that every visit started with a stop at the Hot Sam’s inside the front door on the right. we’d usually head down to the Musicland, Spencer gifts, and take a stroll through Dillard’s and Goldsmith’s to check out the new Swatch watches and Coca Cola polo shirts. after a few hours checking out the sights (read: girls!) we’d head back home, usually with a stop at Cat’s records on the corner of Coleman and Austin Peay just to see if there were any good deals in the clearance racks. occasionally i’d go with my grandmother to the Woolworth’s, where they had a cafe, and we’d have lunch. i remember that place having excellent hamburgers! back then the mall wasn’t in poor shape at all, but it was definitely in need of some updating. nonetheless we had a lot of fun there, and it’s a shame to see it in such sad shape. i imagine they’ll probably put up some big box stores or a Wal-Mart (the world’s most evil retailer, as i refer to them) and raze the rest of it, taking the memories of countless people along with the structure. the last time i was in Memphis i took a drive through Raleigh and was struck by how far the neighborhood has slumped, and i guess the mall is just another victim of the downfall. what a shame. not really a spectacular place as malls go, but it took up a lot of my time. I moved to memphis in 1996. The mall still had its four anchor stores but many other things were closed. The entire area needed an over haul which came to late. Wolfchase Galeria was under construction when we moved their and that was the final nail in the cofin for Raleigh Springs Mall. It is a shame that Management companies do not keep aging malls up to spead with the new malls. They always seem to have about a thirty year or less life and then die no matter what city you go to. Raliegh is no different. 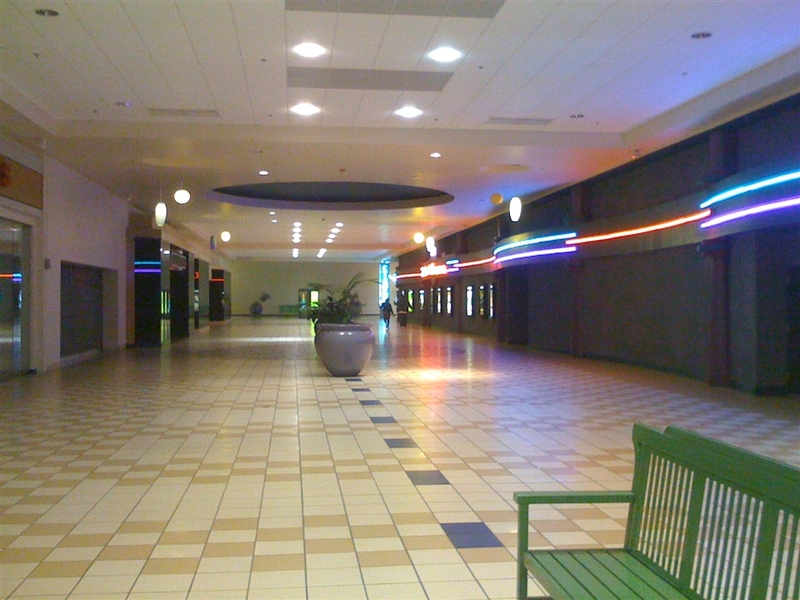 The Raleigh Springs Mall is a dead mall for sure. There are only about twenty stores there and only one ancor (Sears) that looks a little forlorn. On a Saturday morning at 10:30 there were only about a dozen shoppers in the Sears. Oddly, the vacant Dillards space has a for sale sign with a Nashville area code. 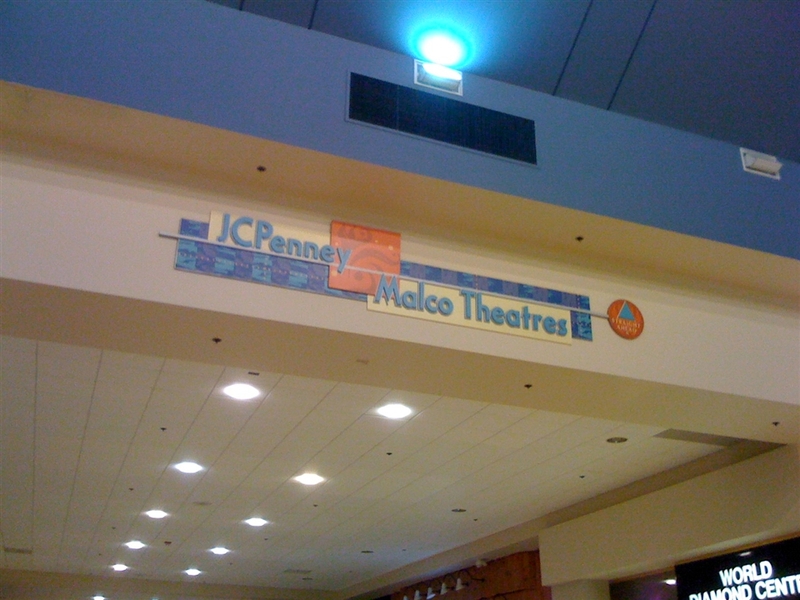 The JC Penney is completely sealed up and no evidence remains inside the mall except the mall guide (or Mallmanac) showing a big space with a number assigned to it. It’s in really bad shape. Oh, and that refresh it went through was haphazard and incomplete. Mixing tacky current design elements with the 1971 architecture doesn’t work. I remember going into the front entrance and being hit with the smell of Chick-fil-a and the sound of “the Peter Gunn Theme” playing on the “Spy Hunter” game in the arcade. I lost so many quarters trying to get past the first screen of “Dragon’s Lair”…. Across from Chick-fil-a was the movie theater where my dad took my brother and I to see “Empire Strikes Back”. As you moved to the end of the main hall, you passed by a cookie shop on the right, an A&W restaurant on the left, and wound up facing the entrance to Goldsmith’s. My favorite sstore was the software boutique to the right and on the same side as Goldsmith’s. Those were the days when Nintendo was just getting big (the NES), and Sears had one set up near its toy dept (back when Sears had a toy dept). Sometimes the machine was set up with a timer; if you picked Mike Tyson’s Punch-out, the timer would reset just as you were about to start the fight with Glass Joe. Its funny, the things you remember. Does anyone know if Simon Bartolo Company(Sp?) developed Rivergate Mall in Goodlettsville (Nashville) TN? It opened in 1971, the same year as Raleigh Springs and the original floorplans were almost identical. Goldsmith’s was acquired by Federated in 1959 !!!!!! Not 2003 !!!!! Federated merged Goldsmith’s with Rich’s (which they acquired in 1976) to one company in 1988 called Rich’s-Goldsmith’s and headquartered out of Atlanta, GA. So acquisitions or the Macy’s name change (that is whole other story as so many people believe, incorrectly, that Macy’s bought out Federated – it is actually the opposite) had nothing to do with the decision to close the Raleigh Springs location. It was closed because the mall was dying and not profitable for the company to continue to do business here. The people in all the Memphis areas complain, but it’s all about shoplifting and gang-bangers. No one wants to shop around GBs, not even other GBs. And the stores in the area ( I work in the area) all leave because the theft eliminates their profit. It’s the same thing nationwide. Blacks can’t have nice things because half of our poplulation still believes the world owes them something and they live by stealing what they want to, Sometimes it’s things they can’t afford, and sometimes it’s just because they are scumbags. I do not blame any business that turns their back on these neighborhoods. Business is business, and when you can’t do business in a community, no one can blame them for leaving. Bart is right in what he said but it is not the only thing. As white flight changed the complexion of the Raleigh area, the stores that occupied the mall were not the type that blacks most often patronized. I hate to say it but if you don’t sell cheap bling, cell phones, beepers gaudy tennis shoes or Tommy Hilfiger, you are pretty much lost. The general income level of the African American population also didn’t rise to the level that would support the more up scale merchandise sold at stores such as Goldsmith/Macys and Dillards. 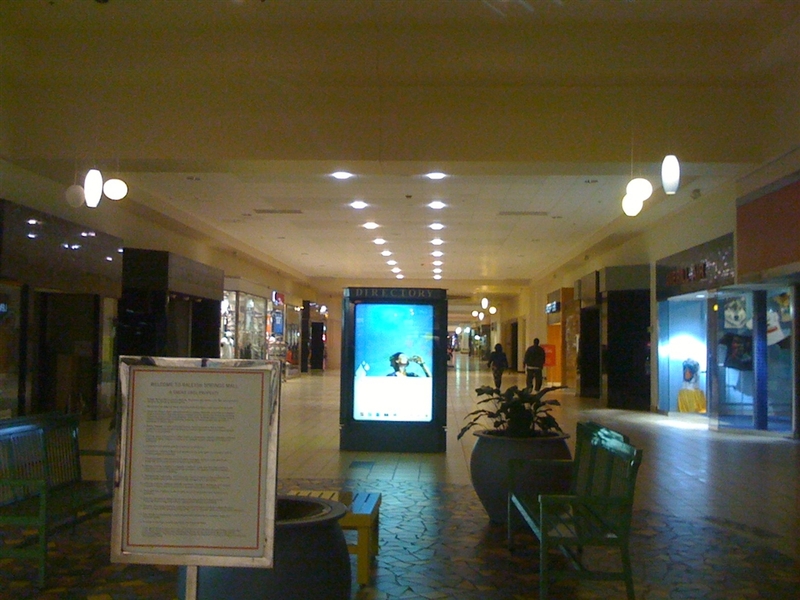 The typical mall jewelery stores, Zales, Bailey Banks and Biddle and others did not carry the mechandise often sought by the usual black customer. It wasn’t gaudy and cheap enough. The quality merchandise was just more than they wanted to pay. I have lived in the Raleigh area for almost 30 years. I have watched the mall slowly die. After the new movie theater opened my wife and I went there only twice and swore we would never go back. You couldn’t enjoy the movie because it seems the young blacks just can’t stay civil and are constantly disrupting the movie. There was great hope that if Wal Mart moved in, it would revitalize the mall. But that deal never materalized and Wal Mart is now doing a total re-do of their current store on up Austin Peay Highway. They are turning it into a smaller scale super center and apparently no longer interested in the mall. The malls down turn is typical of what is happening to the rest of Raleigh. At one time there was no less than 4 full service grocery stores, now there is only one. There used to be a good selection of REAL restaurants such as Red Lobster, Ruby Tuesdays, Applebys along with a couple of good locally owned restaurants. We actually had TWO Radio Shacks, one IN the mall and another on Austin Peay. Now if you want anything but fast food, you are pretty much out of luck. Raleigh has suffered the same fate as Whitehaven in south Memphis, white flight. House values have fallen as a large number of homes are sold to people who only want to turn them into rental properties. Renters generally do not have the pride in their homes to maintain them like a real homeowner would. At one time, when people spoke of Raleigh, it was referred to as the “Raleigh/Bartlett” area. Now you don’t hear Raleigh associated with Bartlett. It is now Raleigh/Frasier. Raleigh is dying. I am 27 years old and it saddens me that a lot of my childhood…Mall of Memphis, Raliegh Springs Mall, Libertyland are no more! The only real landmark standing is Graceland, that i used to frequent as a child. And, yes I am a Black professional and I LOVED shopping at Goldsmith’s, JcPenney, County Seat, eating cookies from the Cookie Jar, and eating at the now defunct Hasting’s Place. It is a matter of time before the whole city of Memphis is one H.A.M.! @Krissy, I just read your post and don’t understand why you had to specify that you are a Black professional.!!!!! @Ron, I drove through Austin Peay today, and it made me so sad to see the demise of Raleigh Springs Mall. Bored, I decided to look on here after three years late responding to this, smh! I included that because previous postings were placing ALL black people in the same boat, and it’s not fair. Hell, I am a professional, and not ashamed of it! Or would you feel better if I said that I was a slum who only received handouts/government assistance? Find something better to do dear! 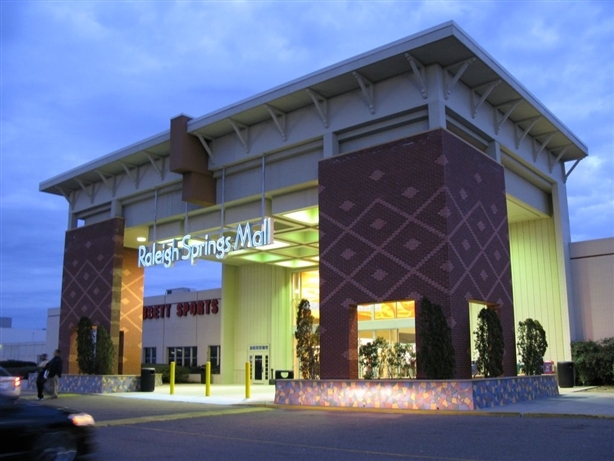 I am from Memphis and remember Raleigh Springs Mall from my childhood. We lived in Whitehaven but my mother had a friend in Raleigh and we would see her and we would usually go into that mall. Everyone who talks about Raleigh Springs talks about HOT SAM. Honestly, I don’t think I ever did Hot Sam’s because I don’t like soft pretzels, but that is just me. Changing demographics is part of the reason the mall is in decline, but Southland in Whitehaven is still there with a mostly black clientele. I think another reason for the demise of malls is that people now shop online, or they go to Wal Mart, or try another place that is much more convenient to go to. Malls seem to be in decline everywhere, which is a shame. One annoying thing in Memphis malls at least, they were closed Sunday night. A lot of times on Sunday I have thought to myself to go to the mall, only to realize that it’s closed. Argh! An earlier post stated that there were no longer any stores for African Americans to shop at and that’s why the mall went down. I don’t believe that. I just think that it was due to crime in the neighborhood going up. I’m African-American and I frequented Merry-Go-Round, Rave, Stuart’s, D-Jay’s, Goldsmith’s, and Dillard’s. In fact my fondest memories are of going shopping with my mom or my older brother, and hanging out at the arcade with my husband and his brothers and cousin when we were dating. My mom and I would shop all day, eat at the little restaurant attached to Woolworth (the popcorn shrimp and ice cream sundaes are legendary! ), and go see a movie (when the theater was at the main entrance in the 80s and early 90s). I even remember doing a Tommy Hilfiger back to school fashion show at Dillard’s when I was in high school, in the late 90s. I miss those days. 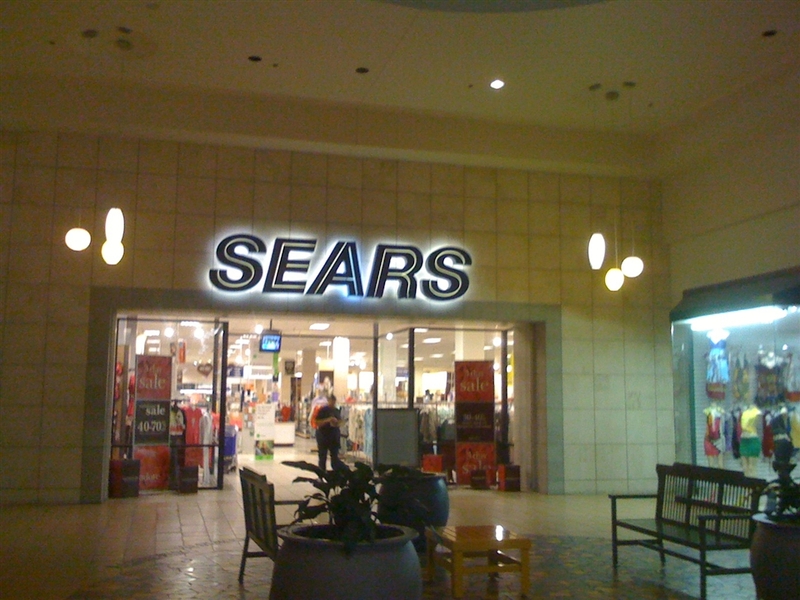 Also, the only anchor store that was left, Sears, closes mid-April 2011. Honestly, I don’t like living in Memphis at all anymore (due to the crime and racism), and I plan on moving out of the south next year. I grew up in north Memphis (that area got bad quick), but my family and I frequented the Raleigh area. When I was younger, I always wanted to live in the area. I live there now, but there’s not much that goes on in my neighborhood since there’s 3 police officers that live near me. I think Raleigh is pretty tame, compared to Frayser, south Memphis, north Memphis, and Whitehaven. My parents recently had their house broken into 3 times last year; twice within a week, right before Christmas 2010. If you really want to live in the Memphis area after reading all this, I suggest you stay in Cordova, Germantown, or Collierville. They have really good shopping in those areas, and the crime is not as bad. 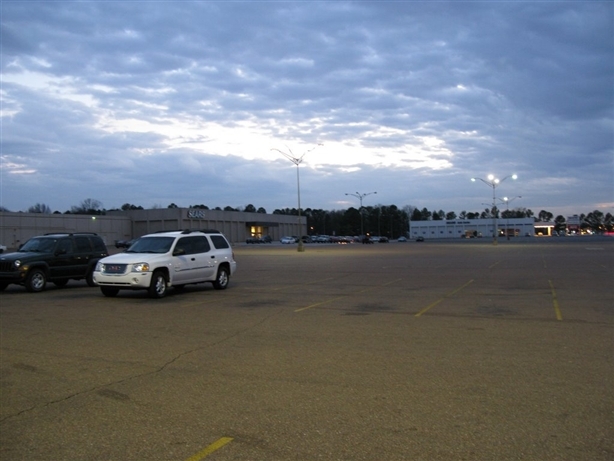 The Wolfchase area is still pretty good too, and they have the only centrally located mall for the city of Memphis. While I hate the traffic, the Wolfchase mall is really nice. I like it even better now because they just added Sephora a couple of years ago, and Teavana just opened last year. I frequent both, and you’ll love the service you get. If you visit in the Spring or Summer, you have to check out The Avenue at Carriage Crossing in Collierville. It’s an open-air mall, all out doors. You will love the fresh air and the Macy’s. If there’s a Macy’s in heaven, it would look like this one! It’s beautiful and full of windows to let natural light in. The also have a Sephora, The Limited Too, and Massage Envy. Also there’s Charming Charlie, for shoppers like me. If you don’t know what it is Charmin Charlie’s is a store for people with mild OCD. I color code my closet, which is what Charming Charlie stores do with their merchandise. This makes it easier to find exactly what you’re looking for.I hate stores where I have to search through items. I just look at the rack, and I stop if something catches my eye. Needless to say, something always catches my eye at Charming Charlie’s. 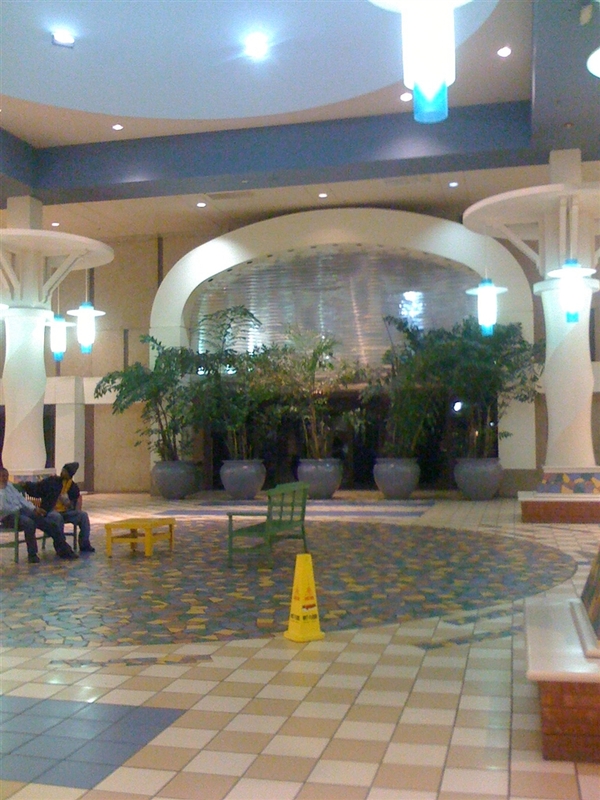 I’m sorry this turned into a trip down memory lane, then into a blog about the Memphis area malls. Hopefully it helped someone out though. Smooches! 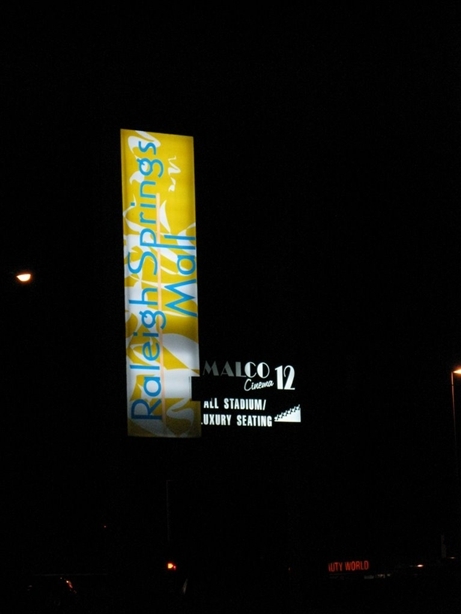 I grew up in Raleigh before the Raleigh Springs mall was built and witnessed it built. I lived around the corner on Craigmont. I loved Hot Sams Pretzels and going to the movies and getting everything for only 5.00 dollars. I was a semi-professional Fooseball player by age 15 and enjoyed playing all day on 1 quarter at Sultans Castles I would play minimum of 6 hours a day every day. I gave some pro’s a real run for their money. I started playing fooseball when I was 9. I remember the guy who operated Sultans Castle his name was TJ and was a retired electricians mate from the Navy. Im retired Navy, and now deliver mail in Minnesota. Bon voyage! I believe the last anchor, Sears, closed its Raleigh Springs Mall location in the past year or two. That leaves the mall mostly with a collection of lower tier, urban stores. The 1970s through the late 80s was this mall’s heyday. The multiplex theater built in the old Woolworth just a few years ago has also closed. Prior to closing, they had a prominent sign that said something to the effect of, “Cell phone conversations, talking, and disruptive behavior in the theater will be grounds for removal.” (As if this needed to be prominently stated…) Opening a new theater there was a predictable mistake. The original two screen theater (closed years ago) was actually located a few bays in and on the left side of the front entrance. I believe they have since fully demolished the Penney’s store space, which was in rough shape. This is where there was talk of putting in a Wal-Mart. However, there is an existing Wal-Mart less than one mile away. Moreover, you can be sure that if Wal-Mart located to the mall property, they would almost certainly NOT open into the mall, which would then kill any remaining viability that structure would have as a conventional mall. The Mall of Memphis opened around 1980 with a lavish paid admission gala featuring multiple interior stages and performers (magicians and the like), as well as linen-covered buffet tables loaded with spreads of fine foods. I attended the event. The Mall of Memphis was impressive back in the day, and did a booming business in its early years. A few years prior to closing, they spent several million dollars giving it a facelift and update. It was in remarkably good shape and appearance at the time of closure (inside it was immaculate and looked almost freshly constructed), but a local real estate firm somehow convinced the owners that “the land” was what had the real value, and it was demolished. After demolition expenses, I’m not sure that proved to be a particularly profitable move. The Hickory Ridge Mall was an absolutely terrific mall back in the day. It was the king of boutique stores, had an interior carousel, and was generally more upscale than the Mall of Memphis. They also had a major expansion back in the late 80s, or early 90’s, adding a large wing of shops to the rear. The area in which it is located was once considered upscale yuppy, and stunningly, has become dubiously urban. While there are certainly good people in the area, crime is a problem. A couple of notes on things commenters have mentioned: the restaurant adjacent to Woolworth’s was “The Harvest House” coffee shop. It was a surprisingly decent restaurant. I believe they (it was apparently part of a chain) were also owned and operated by Woolworth’s. The arcade in the mall was in fact “Sultan’s Castle.” The older gent who managed it – and if you went there back in the day he was hard to forget – his name was Rudy. There was also a Shoney’s inside the mall – to the left of Sears. And I, too, consumed many a soft pretzel at “Hot Sam.” They were garden-variety soft pretzels, but they hit the spot. Hot Sam had a very tiny, narrow space finished in chrome and mirrors, which seemed more like a cubbyhole, and it was walk-up only. Lots of memories for a lot of people.